There's never a dull moment on Wall Street, especially with holiday shopping under way. Let's go over some of the items that will help shape this coming week. 1. Black Friday Meets Cyber Monday: Online retailers can't let their brick-and-mortar counterparts have all of the door-busting fun. Several years ago, somebody coined the term "Cyber Monday." According to lore, the Monday after Thanksgiving is the e-commerce equivalent of Black Friday. It makes sense. It's when folks return to work after the extended holiday weekend, lamenting the gift items that they weren't able to nail down between forkfuls of Thanksgiving leftovers. Since online storefronts know that they have tighter windows than traditional retailers, given fulfillment and shipping deadlines, they too, need to make sure that they strike with their best deals as early as possible. We'll see how the day plays out, though you won't be alone if you dismiss both Black Friday and Cyber Monday as marketing ploys and just go shopping on your terms. 2. Book It: Barnes & Noble (BKS) shares got a boost after the company introduced the Nook Tablet earlier this month, and now it will have a golden opportunity to discuss its initial sales. The bookseller will report its fiscal quarterly results on Thursday. Analysts foresee a small profit, reversing a modest deficit a year earlier. However, the real meat to this report will be about what has happened since the quarter came to a close. The holiday shopping season promises to be competitive. Sure, Barnes & Noble won't have to deal with Borders this year, and that's certainly going to help in terms of physical retail. However, the company has a lot riding on its $250 Nook Tablet and its now-cheaper e-readers. Things seemed to be going well until the Kindle Fire hit the market at $199. It also doesn't help that desperate tablet manufacturers are clearing out their inventories at ridiculous prices. Between $99 TouchPads and $199 PlayBooks -- even if these were "limited time" clearance moves -- this season is certainly confusing for shoppers. The Nook Tablet was supposed to be an entry-level tablet with e-reader sensibility, but now there are a handful of even cheaper alternatives. Keep a close eye on any guidance issued by the superstore chain. It will tip off the public as to how well the Nook Tablet is selling, and whether Barnes & Noble is going to have to take a big financial hit to keep its gadgetry competitive. 3. Digital Music on Parade: It's been a wild year for Web-savvy music buffs. One of this year's biggest events was Spotify's summertime launch in the United States. Now, the firm is apparently raising the stakes. CEO Daniel Ek and probably a few musical celebrities will be in attendance at a news conference Wednesday to unveil what the company is billing as "exciting news" about its future. The big boys have moved in to the business this year, with Amazon.com (AMZN), Apple (AAPL), and Google (GOOG) all rolling out cloud-based music hosting services. However, the tech giants have centered their digital initiatives largely on connecting listeners to their existing music collections and getting them to buy more. Spotify should be holding up well as more of a virtual jukebox, but it will be interesting to see what it has up its sleeve in what has quickly become a crowded competition for your eardrums. 4. Mauled at the Mall: Since most retailers work on fiscal quarters that end in October instead of September, a lot of the earnings reports that will be published next week will come from those chains. Unfortunately, the news doesn't appear encouraging. Aeropostale (ARO), American Eagle Outfitters (AEO), Talbots (TLB), Coldwater Creek (CWTR), and Big Lots (BIG) are just some of the retailers targeted to post declines in profitability. There will be some winners, including rue21 (RUE), Tiffany (TIF), and Jos. A. Bank (JOSB), but a mixed showing is certainly not what economists were predicting last holiday season, when many felt that the economy would be treating retailers to more holiday cheer this time around. 5. 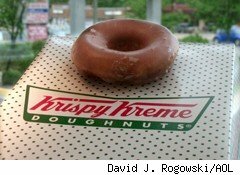 Doughnuts Can Make Your Dough Nuts: Krispy Kreme (KKD) was a market darling when it went public 11 years ago. The tech bubble was getting ready to burst, and investors flocked to a popular brand making affordable yet unhealthy treats of escapism. Krispy Kreme's bubble popped a couple of years later, and the result was a franchisee mess that oozed Bavarian custard and cascading share prices. Krispy Kreme's stock has been largely trading in the single digits for the past four years. It's a shame, because the doughnut king is back to making dough rise again. Analysts see profitability doubling in its latest quarter when Krispy Kreme reports on Wednesday. We'll see if the company's turnaround is still on track -- hopefully this time without the custardy bloodshed. Longtime Motley Fool contributor Rick Munarriz does not owns shares in any of the stocks in this article. The Motley Fool owns shares of Apple, Google, and Aeropostale. Motley Fool newsletter services have recommended buying shares of Google, Apple, and Amazon.com, as well as creating a bull call spread position in Apple.